My blog’s traffic in September was 35,862 versus 36,154 in August, a decrease of less than 1%. I got way behind on both the blog and podcast in September, only writing 3 posts in September. I made a couple of changes last month to my blog that I think has at least improved my issue with falling search traffic. The first is I went into my robots.txt file and made sure it including the path to my sitemap. As soon as I made this update, I noticed in Google Webmaster Tools that Google immediately started indexing an additional 200 pages from my site. Also, I noticed a slight uptick in search traffic from that point forward. Not huge, but definitely noticeable. So much so that I believe search traffic will actually go up for October vs September. So this might be something for you to explore, I had manually submitted my sitemap via Google Webmaster Tools before, and that didn’t seem to register, but adding the sitemap URL into my robots.txt file seemed to do the trick. Referral, Social and Email being down is directly related to writing fewer posts in September, as I only wrote 3 posts for the month. I got too caught up with client work and didn’t devote enough time to regular posting and it bit me. Case in point, I published more posts this week than I did all of last month. Strong growth throughout the year but it did start to tail off the last couple of weeks of September due to no new episodes going up. 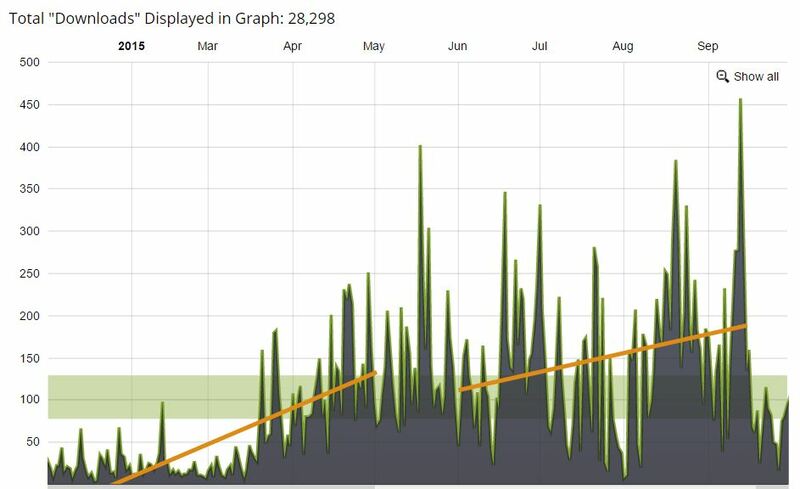 On Wednesday I published the first episode of #FanDamnShow for this month and daily downloads had continued to fall this month up till that point. A good reminder for me to make the time to create regular content for both my blog and podcast in order to build or even sustain an audience. This are the goals I set at the start of the year. I’ll check back in next month and let you know how I did! I want to use email marketing to increase traffic of my business but in your case email marketing is going down. So should I use email or not?